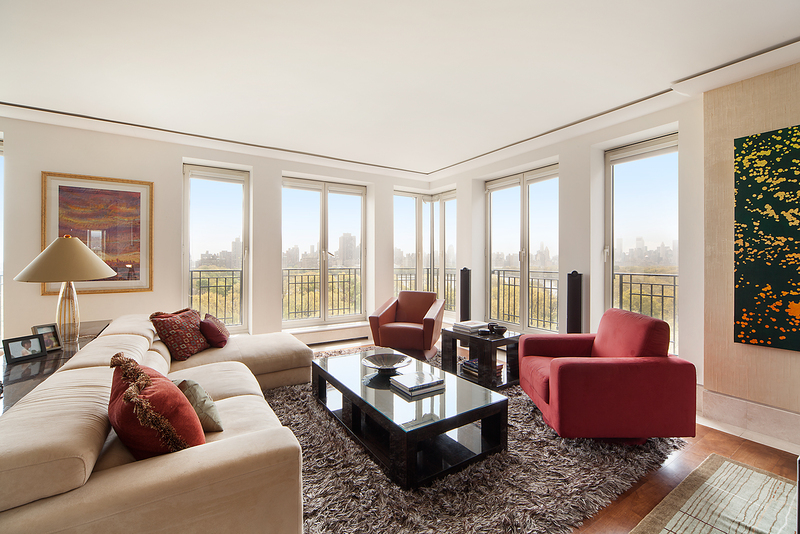 Designed by world-renowned architect, Ismael Leyva, this beautifully renovated, full-floor home offers a gracious layout with breathtaking panoramic views of all of Central Park down to Central Park South and beyond to the Empire State Building. A private elevator landing leads to the Marmol foyer and gallery, and to the open living space with an Onyx wood burning fireplace, LED lighting and balconies to the south and east overlooking the park. The open plan kitchen and dining room, has an integrated stereo and entertainment system, making this a perfect home to entertain in. Modern architectural details blend seamlessly with state-of-the-art conveniences in the Italian lacquer kitchen, across from a separate service elevator. This 2,733-square foot home is currently configured as a 3 bedroom plus a library, offering a flexible floor plan. Lavish well-appointed interiors include 9-inch Scandinavian oak plank floors, four full Marmol bathrooms, central two-zone air conditioning with perimeter heating, private washer and dryer and floor to ceiling casement windows.